Strange things are happening at Lovecraft Middle School. Rats are leaping from lockers. Students are disappearing. The school library is a labyrinth of secret corridors. And the science teacher is acting very peculiar - in fact, he just might be a monster-in-disguise. Twelve-year-old Robert Arthur knew that seventh grade was going to be weird, but this is ridiculous! 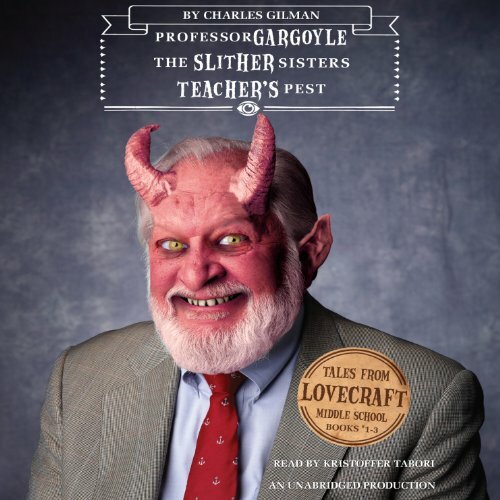 Professor Gargoyle (Volume I in the Tales from Lovecraft Middle School series) is full of bizarre beasts, strange mysteries, and nonstop adventure. You won't believe your ears! The second novel in the Tales from Lovecraft Middle School series, The Slither Sisters, begins right where Professor Gargoyle ended. Seventh-grader Robert Arthur has discovered that two of his classmates are actually sinister snake-women in disguise. Even worse, his new middle school is full of "gates" to a terrifying alternate dimension - a haunted mansion full of strange spirits and monstrous beasts. For Robert to protect his teachers and classmates, he'll need to return to this haunted dimension with his best friends Glenn and Karina. Can they uncover the secrets of Lovecraft Middle School before it's too late? DON'T BE FOOLED by his friendly smile, his perfect manners, or his shiny red apple. Student council president Howard Mergler is actually a sinister bug-monster in disguise - and he's summoning swarms of roaches, wasps, fleas, and head lice into the corridors of Lovecraft Middle School! Robert Arthur is the only student who can stop him - but he'll need help from his best friends: the school bully, the school ghost, and an extremely courageous two-headed rat. Teacher's Pest, the third novel in the Lovecraft Middle School series, begins right where Professor Gargoyle and The Slither Sisters ended - with more action, more adventure, and more outrageous monsters!